Gamma Ray will be performing at the Cafe Campus, in Montreal, on January 29th, 2011. On the very next day, January 30th, Gamma Ray will also be performing in Quebec City, at L'Imperial. 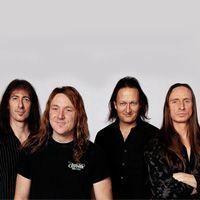 Founded in 1988 by Kai Hansen (after the demise of his previous band Helloween), German metal band Gamma Ray released 10 albums in its 20-year career. The latest, entitled To The Metal!, was released on January 29th, 2010. Be the first informed if we receive new tickets for Gamma Ray. You will than get a priority choice in our tickets inventory. Enroll yourself to our priority waiting list for Gamma Ray to be alerted when new tickets are available. Filling this form doesn't engage you to any purchase. 2Tickets.ca acts as a third party and is in no way associated with Gamma Ray.